A few months ago I did a post with different ideas for how to wear booties (find it here), and it went over so well that I thought I would do a second one with another staple of mine: my chambray shirt! It's one of my favorite pieces because it's pretty much a neutral and because it can be worn year-round. Oh, and they're an affordable item to buy! I know chambray shirts are nothing new or hard to style, but I still love mine and am still finding new ways to wear it! Hope you had a great weekend and enjoyed the Super Bowl! Even though the game was a blowout, I was rooting for the Seahawks so I was happy that they won, and enjoyed the commercials and halftime show too. Love chambray! Such an easy go-to piece. I always love the denim on denim look :) Also love how you layered it under a sweater. 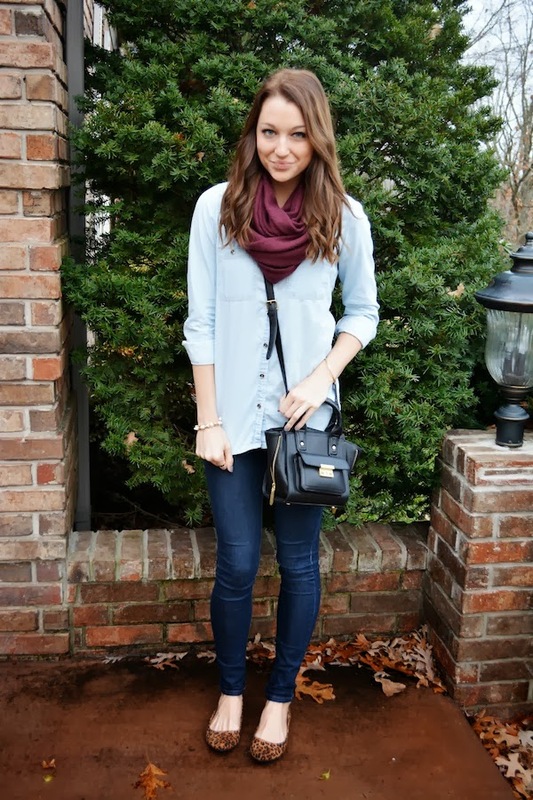 You have definitely shown how versatile chambray is! Love these chambray looks, you are always so well put together. The chambray top is essential to everyone's closet! Love all of the different looks! I especially love it with the denim shorts! Too cute! I love how versatile chambray shirts are! A must have! i agree chambray goes with just about everything and anything! these are great! Such a great posts! I forget how versatile a chambray shirt can be. I am in love with the first outfit. A white skirt is perfect for spring/summer.